My hands are a really important body part. My hands enable me to do all the things necessary to keep myself alive and well in the mountains; handling ski poles, ice tools, dressing myself, cooking, feeding myself. . . I am very serious about keeping my hands warm and happy. I’ve gone my whole life without frostbite, and I fully intend to maintain that record. Here are some of the things I use to keep my hands happy. First, are the light gloves. These are the fair weather, or high dexterity task gloves. I like fleece with a windproof laminate. They are surprisingly warm and comfortable, but don’t count on them for a second in wet conditions. They will soak through. Carry a few pair of these types of gloves so that you always have dry ones handy. I use mine for tasks like setting up a tent or fixing dinner. I keep mine in my pockets while active so that I can slip out of a mitten and into a glove if I need to readjust a binding or some other task that is too intricate for clumsy mittens. My personal favorite gloves over the years are the Black Diamond Windweight gloves . Next, a good pair of work gloves are necessary. These are the gloves with thick leather palms for handling poles, ice tools, ropes, and so on. These are the gloves that get used and abused and destroyed rapidly from all the use. In warm weather, like spring when it can be easily above freezing during the day, a great solution is to go to any hardware store and buy some all leather work gloves for 10 dollars and rub them with neatsfoot oil to waterproof and soften them really well. But, for cold weather, something more substantial is necessary. I want good leather palms, and a high gauntlet to keep my wrists warm. It also helps to have knuckle padding. My personal favorites are the now discontinued Black Diamond Ice glove. Black Diamond has a new version that they call the Enforcer Glove . Finally, big and warm mittens are like sleeping bags for your hands. Definitely do not skimp on the mittens. Durable palms, and lots of puffy insulation will keep your fingers intact and warm. I don’t wear liner gloves inside my mittens because that defeats the idea behind mittens. I want the blood flow in each finger helping to keep the other fingers warm. It is nearly impossible to do anything in proper mittens. Opening my water bottle, and maintaining a grip on a ski pole or ice axe is about all I plan to do in mittens. Mittens are especially important if you have to wear a backpack. The straps seem to always reduce blood flow to the hands and arms. Keep that in mind while traveling, and make sure your fingers are always getting blood flow. Stop and shake some fresh blood into your hands on occasion. 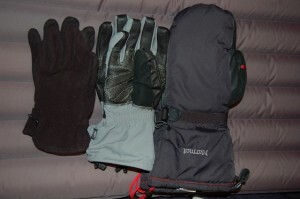 I like to use Expedition Mittens from Marmot. These are packed full of insulation and are lined with a soft wicking layer to keep hands dry. I have a big pile of gloves and mittens I’ve accumulated over the years. I’ve tried most combinations I can think of, and this is what works well for me. Let me know what works for you.